I am a prisoner under torture and from a famous family which its name has been mentioned in reliable religious books and I devoted more than 30 years of the best days of my life for dissemination of monotheistic thought, spiritual culture, divine ethic and religious literature and it's two and a half years that I have been under physical and psychological pressures and affected by various diseases in different sections of Evin on charge of rejection the political and governmental religion, during this period I have sent letters via related person to you and expressed the realities for several times but each time the result was increasing the tortures . Now that I'm in the point of death because of abundance of pains, I want to inform the world about some mysteries by writing some words because the world knows this public prosecutor who asks for belief freedom and thought independence completely and (world) records his words as the reliable documents. 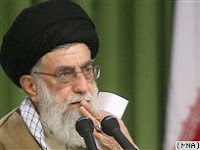 Today, the majority of Iranian people have tried political Islam and have seen its result during the age of this revolution (Enghlab), they heard the important and effective promises in establishing the society in 30 years ago by the founder of this government and understood the results of those great predictions obviously, Now Iranian people are asking for removing the belief censorship, religious inquiring and also pressures and limitations in choosing life style. The majority of people say; if the Shah regime was changed by the majority vote of people, now that majority is asking for removing the suffocation, oppression, despotism and suppression too. If the criterion of the present government is the votes of people, a referendum must be held in an open space, with no fear and no governmental choice and limitation , the election must be held under the direct attention of United Nations watch ,because according to available evidences Iranian authorities are criminal ,they have committed treason against Iran, Islam and the nation for several times and its effects are appeared in executions , ravages, imprisonments ,cemeteries and exile . How will the idea and ideals of 70million of Iranian people be fulfilled while the election is controlled by the Guardian council and the foreign ministry? How can claim that the elections are public and correct when Mr.Karoubi who is one of the government acting, confesses that he slept for a short time and when he waked up there were some basic and important changes in the results of election? The founder of this government said 30years ago; "if the legality of Mohammad Reza Shah regime was because of the assembly of his father, Reza khan, it doesn't concern him (Mohammad Reza shah must get legality again) " now I repeat his logic too; if 30 years ago Iranian people accepted such political regime though they were deceived and thought the basic of this regime is independence , freedom , republic and theism which gradually they saw the unreality of the regime ,now they are not disposed toward continuing this regime and in order to confirm this word , permit people to march in all over the country, if the population be more than march population on 22 Bahman Month(anniversary of Enghlab57) you must accept the demand and the desire of nation or at least accept the freedom of society , thought ,religion and worship and view independence . How can Iranian people forget the strange promises of your master in Behesht Zahra while he (Mr. Khomeini) promised a beautiful world and a society with good facilities which poverty, misery, suffering, disease, meanness, family disintegration, addiction, economical pressures and religious dishonor were its results? Today the merciful and gracious God is in charge place, because every crime is committed by the name of religion. my father who was one of the great clergies of the capital of country, was killed and his tomb was destroyed because he didn’t agree this theory" our religion is the same our politic" and my mother who was daughter-in- law of a religious authority and wife of a religious expert and mother of descendents of the prophet, was killed unjustly, and my 6-month-old grandchild was tortured in 209 section of Evin by regime factors to oblige me to confess to have cooperation with George Bosh ! The crime of this liberal clergyman, who is opposed to governmental religion, is only his popularity. Before the attack to my house, I held my latest pray meeting which was full of devotion to God, in the biggest covered stadium of country and gathered tens of thousands of oppressed and poor people, with out press support and in strict boycott to help and console them, this unique gathering made the ministry of Information angry so by a cooperation with special court attacked to my house and hurt every one there such that hundreds injured were its result and its films are available in world legal societies and the humanism centers archive. They used chemical and microbial gas in order to suppress the people who were asking for separation of religion and government and many people were affected by brain, lung, liver, chest and stomach cancer due to this gas and every month they die one after one. Now politicians, religious personalities and me who are not dependent on the government are tortured in Evin prison by your name and for continuance of Velayet-e-Faqih such I have grave physical state. The day when the Lebanese prisoner was released from Israel prisons, I watched him via a TV in prison, was in physical and psychological health, but look at my pictures before imprisonment and compare them with my body which is the result of these two and half years ! Now, I ask you who are the leader of this government, were Iranian people irreligious 30 years ago and then the founder of this regime made them Moslems? Were people of this country poor and this revolution got them rich? Are the rate of your tortures and torments as before? Is the number of prisons as same as before? Your master ( Mr. Khomeini ) in the beginning of arrival to cemetery of the capital of country said in front of reporters;"shah destroyed cites and built cemeteries", I ask you; is your 30-year-old result another thing? Aren't the general massacres in the beginning of this government and during the 8 years war inside cities and in borders and also annihilating the parties and your rival equal to the general massacres during 2500 years of imperial government? What have you done for these people that you are proud of it? The present of 57 Enghelab( Iran revolution) is motiveless of youth, unemployment, cutting off the electricity, gas and water and increasing the expensiveness and dearth , plunder the natural sources and national heritage and opinion chaos and many other cases.